The wine poured out opaque and intensely colored, and I said, “This is no wimpy wine.” The nose was bold too, but with very sweet fruit compote aromas suggesting plums and boysenberries. It had me expecting a very jammy palate, and there was certainly a big burst of up-front dark fruit. But it dried out very quickly and started showing some good structure. Now I checked out the grape blend, which is traditional Southern Rhone style: Syrah leads the way at 73%, and Grenache and Mourvedre (along with Bordeaux’s Petit Verdot) complete the package. These grapes are no surprise, as Paso Robles has become the epicentre of California’s Rhone Ranger movement. The palate of this wine, though, reminds me much more of Australia’s Syrah/Shiraz based wines. The rich, juicy fruit is more like a GSM (+PV) than a French Cotes du Rhone. So back to my tasting session: the palate is rich and fruity, but not sweet, and good acid keeps it from becoming overly jammy. The flavors lean toward blackberries and cranberry, with generous vanilla and mocha notes. The finish hangs on quite well for an under-$20 wine. 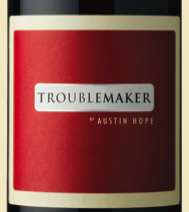 I liked this a lot, and I think it’s a fun, unpretentious wine that could appeal to young and adventurous wine drinkers. The current price is somewhat reduced, which is a smart marketing idea in these times, and I think it could move well. 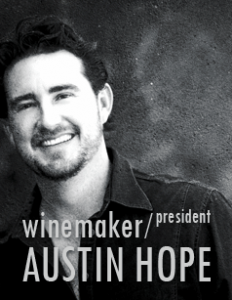 It also makes me want to taste more of Austin’s wines, which is a good thing for Hope Family Wineries. Cheers! Had a glass of this wine with dinner at a fine Bar Harbor restaurant .I enjoyed it SO much that after dinner ,I went to the wine store next door and bought an entire CASE to take home to Connecticut!! Hi Kaen – Thanks for your comment. I can see this wine tasting great with the kind of meal you’d have at a Bar Harbor restaurant. I’d love to be there drinking and eating too! I tried a glass of Troublemaker at dinner tonight and found it delightfully tasty. Paso Robles rarely disappoints me and this was no exception! Would be interesting the save a bottle for a few years and see how it matures. Thanks for your comment. I totally agree on the wine and on Paso. It’s a beautiful area to visit, too. Cheers!